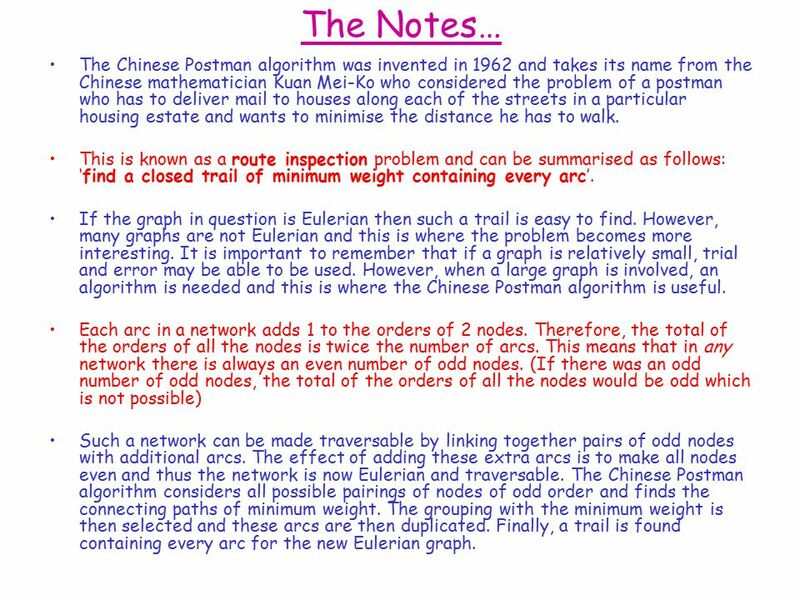 Discrete Maths Chapter 5: Route Inspection Lesson 1: Chinese Postman. 4 The Notes… The Chinese Postman algorithm was invented in 1962 and takes its name from the Chinese mathematician Kuan Mei-Ko who considered the problem of a postman who has to deliver mail to houses along each of the streets in a particular housing estate and wants to minimise the distance he has to walk. This is known as a route inspection problem and can be summarised as follows: ‘find a closed trail of minimum weight containing every arc’. 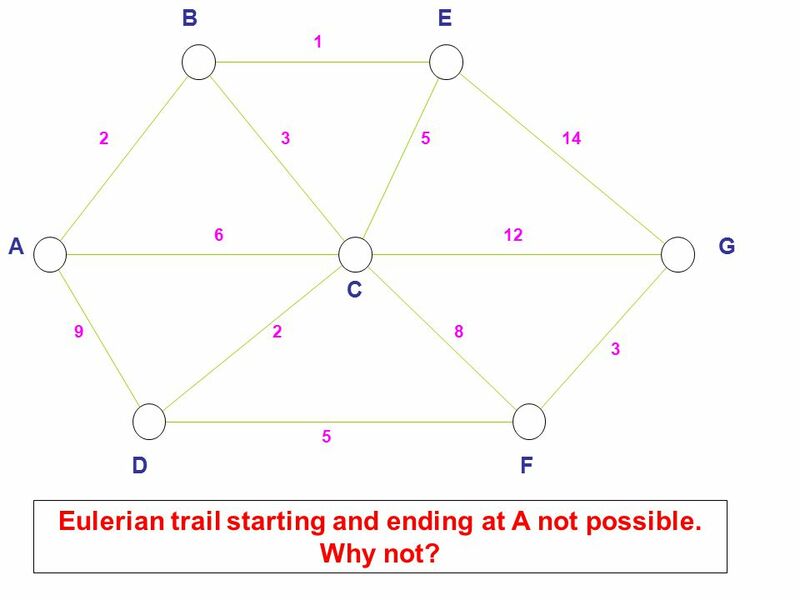 If the graph in question is Eulerian then such a trail is easy to find. However, many graphs are not Eulerian and this is where the problem becomes more interesting. It is important to remember that if a graph is relatively small, trial and error may be able to be used. 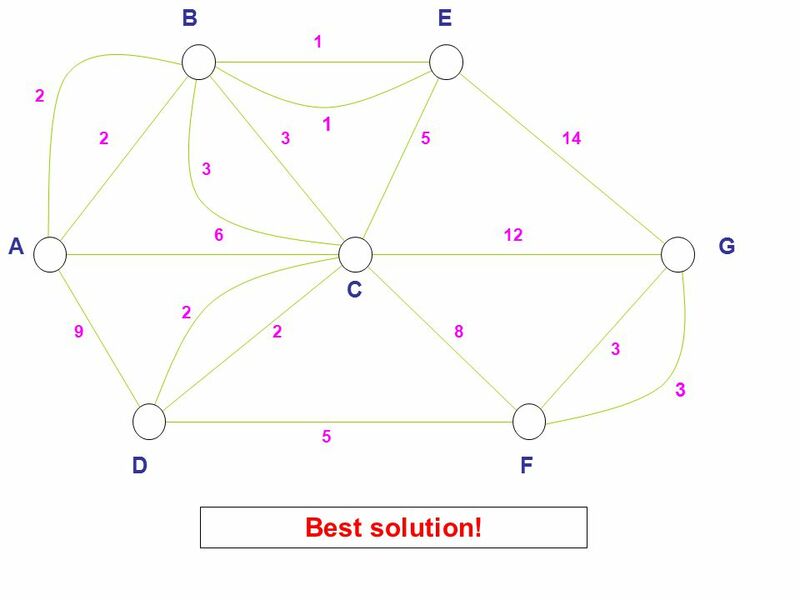 However, when a large graph is involved, an algorithm is needed and this is where the Chinese Postman algorithm is useful. 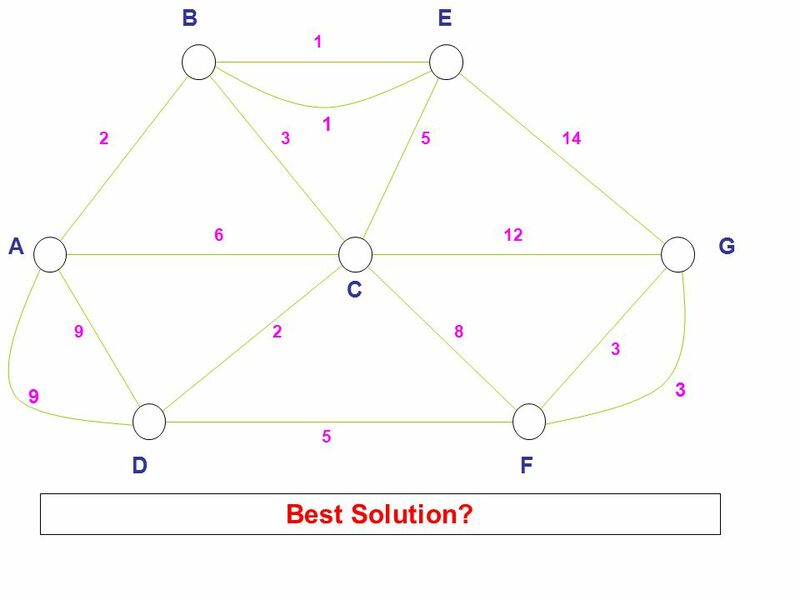 Each arc in a network adds 1 to the orders of 2 nodes. 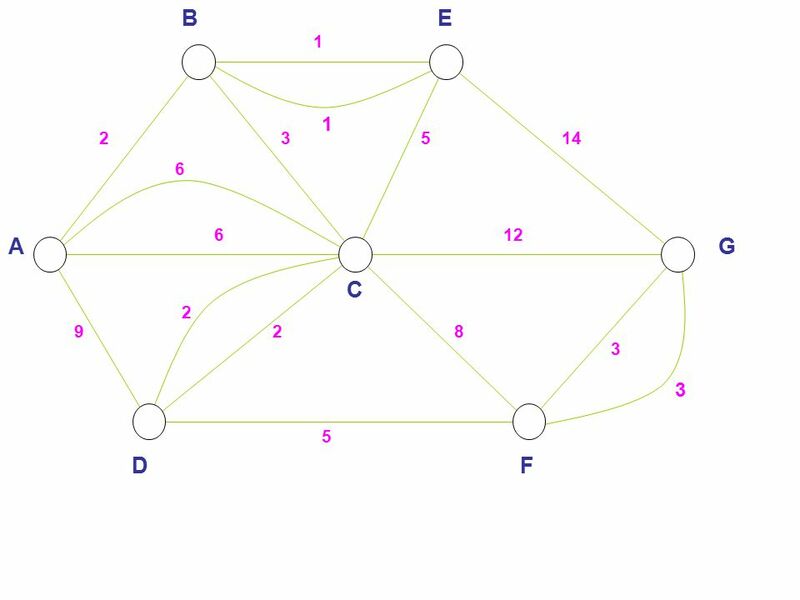 Therefore, the total of the orders of all the nodes is twice the number of arcs. 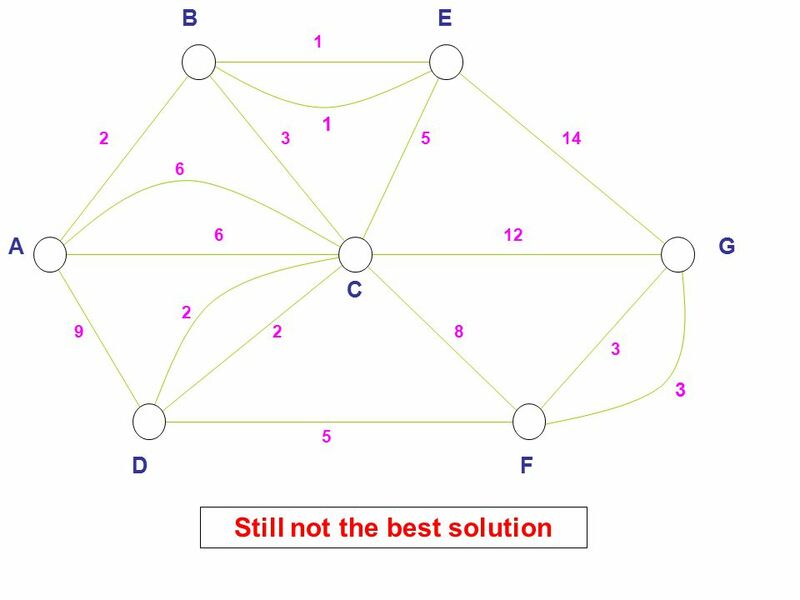 This means that in any network there is always an even number of odd nodes. 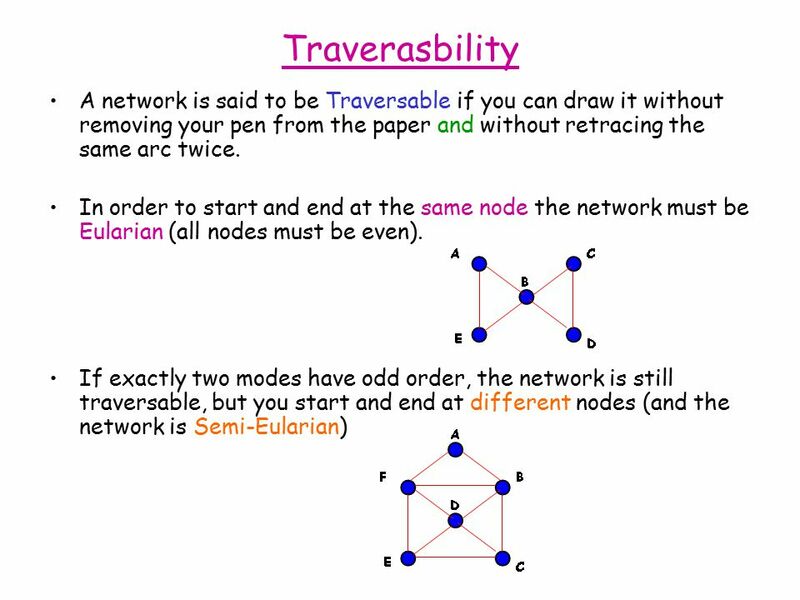 (If there was an odd number of odd nodes, the total of the orders of all the nodes would be odd which is not possible) Such a network can be made traversable by linking together pairs of odd nodes with additional arcs. The effect of adding these extra arcs is to make all nodes even and thus the network is now Eulerian and traversable. 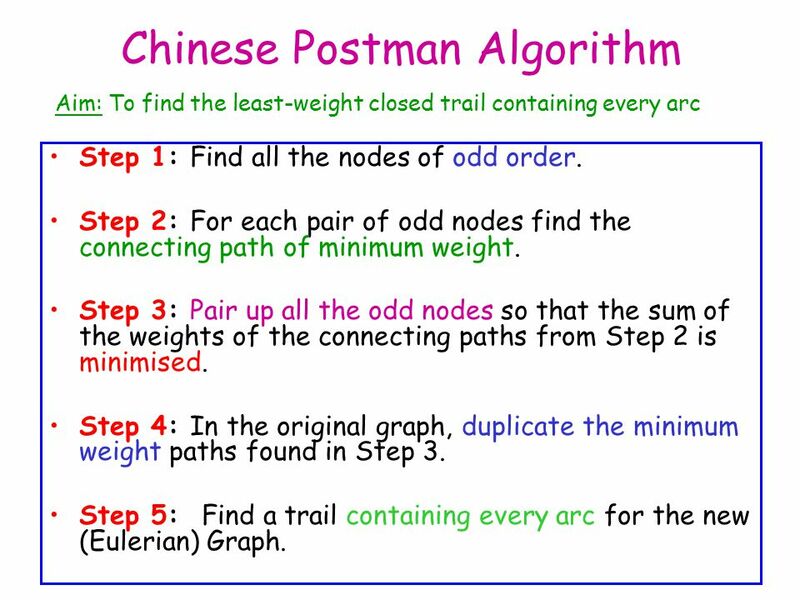 The Chinese Postman algorithm considers all possible pairings of nodes of odd order and finds the connecting paths of minimum weight. The grouping with the minimum weight is then selected and these arcs are then duplicated. 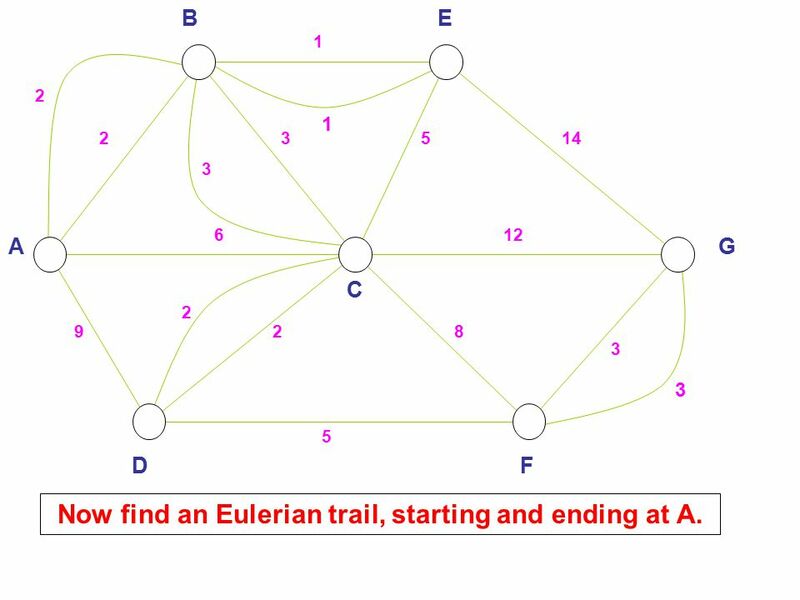 Finally, a trail is found containing every arc for the new Eulerian graph. 5 A EB C FD G 23 6 5 9 1 82 5 3 14 12 Eulerian trail starting and ending at A not possible. Why not? 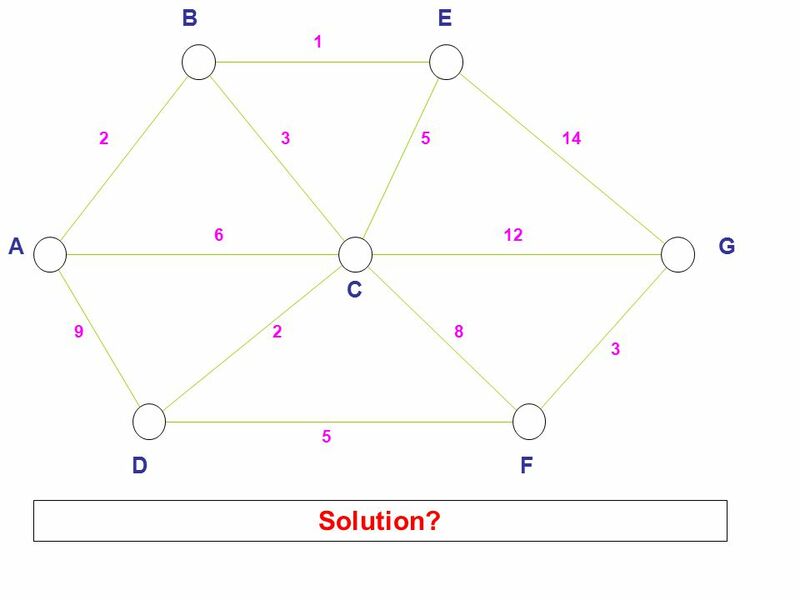 6 A EB C FD G 23 6 5 9 1 82 5 3 14 12 Solution? 7 9 1 3 A EB C FD G 23 6 5 9 1 82 5 3 14 12 Best Solution? 10 2 2 3 1 3 A EB C FD G 23 6 5 9 1 82 5 3 14 12 Best solution! 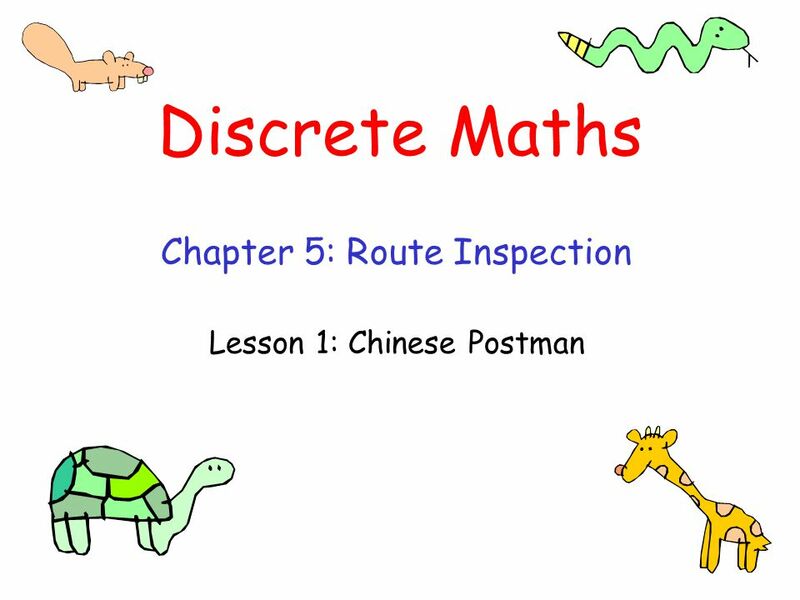 11 2 2 3 1 3 A EB C FD G 23 6 5 9 1 82 5 3 14 12 Now find an Eulerian trail, starting and ending at A.
Download ppt "Discrete Maths Chapter 5: Route Inspection Lesson 1: Chinese Postman." Discrete math Objectives: To learn vocabulary, vertex/edge patterns in discrete math. Vertex Edge Graph - A collection of points some of which are joined. 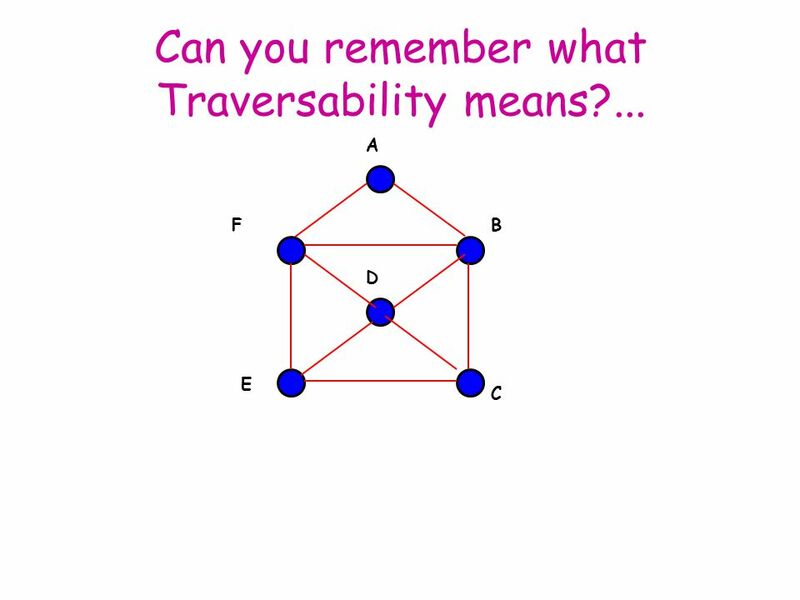 Decision Maths Networks Kruskals Algorithm Wiltshire Networks A Network is a weighted graph, which just means there is a number associated with each. 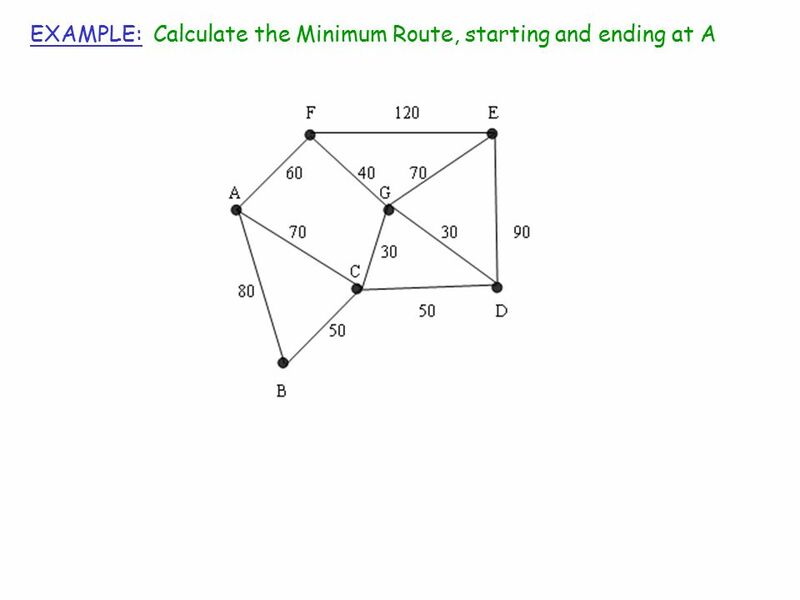 Discrete Maths Chapter 3: Minimum Connector Problems Lesson 1: Prim’s and Kruskal. BY: MIKE BASHAM, Math in Scheduling. The Bridges of Konigsberg. Decision Maths Graphs Wiltshire Graphs A graph is just a diagram made up of “dots” and “lines”. These are all graphs. The dots are called “nodes” or. E ULERIZING G RAPHS Notes 25 - Section 5.7. E SSENTIAL L EARNINGS Students will understand and be able to use Eulerization to find optimal exhaustive. Graph theory at work.  Examine the procedure utilized by snow plows in Iowa City  Systemize and minimize routes  Review mathematical concepts involved. IEOR266 © Classification of MCNF problems. Homework collection Thursday 3/29 Read Pages 160 – 174 Page 185: 1, 3, 6, 7, 8, 9, 12 a-f, 15 – 20. Graphs. Graph A “graph” is a collection of “nodes” that are connected to each other Graph Theory: This novel way of solving problems was invented by a.
Algorithms on graphs In Decision Mathematics, a graph consists of points (called vertices or nodes) which are connected by lines (edges or arcs). Eg in.